Recently enlarged from 8,500 to 30,000 square feet, Houston’s Museum of Natural Science’s Wiess Energy Hall is a testament to the city’s key role in the United States energy sector, with exhibits dedicated to conservation, renewable energy, hydrogen power, and natural gas. Looking to engage visitors with a stimulating visual experience that could keep pace with the expectations of modern technology, the museum redesigned Wiess Energy Hall’s displays and created an entirely new thematic exhibit: Energy City, a 2,500-square-foot 3D landscape of Houston. This project would be a first for the facility in both size and complexity, so it was imperative that the project be cost effective, require minimal oversight, and utilize technology that could last throughout the life of a museum exhibit. Ultimately, projection mapping paired with animation was selected to bring the energy value chain to life. This would be the first projection mapping exhibit of its type and the most ambitious project that the museum had embarked upon. Recognizing Wiess Energy Hall’s concerns and the technological needs of a project on this scale, RabCup examined several projector products and brands. In the end, the team installed 32 Vivitek DU8090Z laser projectors throughout the exhibit. Equipped with a laser light source, the DU8090Z features a WUXGA resolution, 8,000 ANSI lumens of brightness, and a 10,000:1 contrast ratio. This contrast ratio was critical to ensuring the exhibit’s crisp and immersive visuals were maintained, even during night scenes. Since opening in late 2017, Energy City has proven to be among the museum’s top attractions. 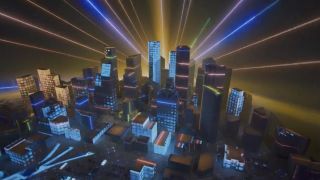 The project is massive, with 32 projectors, 168 fiber optic sensors, 4 miles of fiber optic cable, and more than 30 minutes of custom animation, including a five-minute day-to-night scene and eight science modules. For Energy City’s first year of operations, the projectors ran for more than 3,000 hours. By comparison, lamp-based solutions would have needed to be replaced three times at this point—a collective total of 96 bulbs. Given this fact, a lamp-based alternative would have necessitated the use of nearly 1,000 bulbs throughout the life of the exhibit, resulting in substantial time and money to replace and recalibrate the units, as well as exhibition delays to allow for the proper reset and testing. While the project is still young, museum officials are thrilled with the results. The exhibition runs every day, captivating Houston residents and visitors alike. Energy City has drawn praise from local energy companies, as well as outside museums that have sought to emulate the installation. Watch a video of the exhibit here.